Whether Saansein is just another of those sleazy horror movies that is full of wild screams and predictable storyline or does it offer something different will be decided by the audiences. The movie stars, Rajneesh Duggal, Sonarika Bhadoria, Hiten Tejwani, Neetha Shetty, Vishal Malhotra, Sachi Ruia and Amir Dalvi in the main roles. The movie, directed by Rajiv Ruia, has been released in theatres across the globe on 25th Nov 2016. The extremely beautiful Shirin (Sonarika Bhadoria), who works as a singer in a club which is known to be one of the best in Mauritius, leads a seemingly mysterious life. She turns down any romantic advances and in fact disappears from the club immediately after her performance each night. One night, Abhay (Rajneesh Duggal), who has come to Mauritius on business visits the club and gets attracted towards Shirin at first sight. Although Shirin made effort to ignore Abhay, he is not the one who will give up too easily and wows to find the reason behind her rejection. What he learns is a terrifying truth which is no less than a dangerous nightmare and which puts his as well as Shirin’s life at great risk. Saansein, which was shot at one of the most haunted places in Mauritius, is based on a real life incident. The movie, unlike other horror flicks does not have much skin show but focuses on the strength of friendship and love between the characters to overcome the most difficult situations. Sonarika has given a great performance as Shirin and Rajneesh is also quite good as Abhay, besides which the other actors have also portrayed their characters quite well. 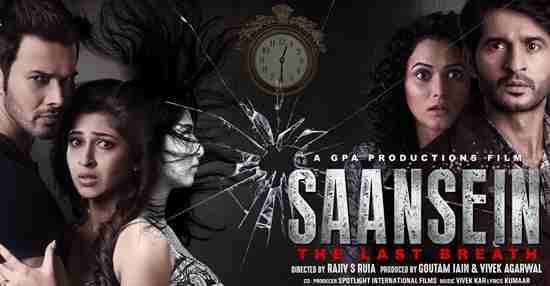 Overall Saansein provesto be good one time watch for people who love the horror genre and IndiaCafe24 gives the movie a rating of 2.5 stars.